In an earlier post, I told you about a recent conversation I had with the kidlets. They want to make quilts too. I want to teach them and foster their love of creating. After a bit of brain churning time, I came up with the perfect idea. A quilting bee just for kidlets, so they can learn about sewing, rotary cutting (with help of course), putting blocks together and combining their blocks into finished quilt tops. * This bee is specifically and only for kidlets between 5 and 10/11 years old, the elementary school age group, basically Kindergarten through 5th grade. * There are 11 spots open for boys and 11 spots open for girls (my 2 kids are the 12th in each group) and it is open to international participants (one 12" block in an envelope isn't too costly to mail). who will choose the block they want their bee mates to make. The emphasis will be on the simple BASIC blocks. A page of suggested blocks are on this page. A different block can be chosen but please make it very simple and only basic piecing techniques. No paper piecing and No applique. If blocks of that nature are chosen I will request that you choose something else. You will email your requested block name and fabric colors to your child's bee mates on the 1st of the month. *Bee mates will not send fabric to each other to use, they will work from your stash. They will be making 12 1/2" unfinished blocks. *Bee members will choose ideally up to 3-4 colors they want their bee mates to use in making the blocks. Please, no focusing on specific characters, only colors. I don't want anyone to have to hunt down fabric in a specific character theme. *Each child will only make one block per month and then send it off to the Bee Princess or Bee Prince for that month. *When it is their month to be the Bee Princess or Bee Prince, they will only make their block to keep for themselves. They will receive 11 blocks from their other bee mates. Then they can work to put them together into a quilt top. *Because life with kidlets can get hectic at times and plans can get changed in an instant or because there can be scheduling issues because of vacations or other events, there will be 2 "open" months at a time, meaning there will be a current month Bee Princess and Bee Prince as well as a future month Bee Princess and Bee Prince. This way if you know in advance that you have things coming up, your child can work ahead and get the next month's block done early. 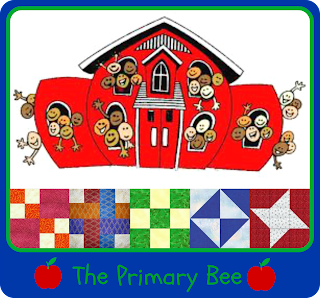 *The main focus of this Primary Bee will be a dual one...to have our kids make their very own quilt with their own 2 hands and to have them make online quilting friends just as I have done. So ideally I'd like blogger's kids to participate. It isn't a steadfast rule but each month I'm hoping the kids will post about the blocks they are making and the blocks they receive so obviously they'd need a blog to post on. I'm going to let my kids write their posts themselves, with a little help of course. *The bee will start next month. Yes I know that it is the holiday season but I for one will have 2 weeks between Christmas and New Years when the kids are home from school so that will be the perfect time to get some sewing time in with them. This is a 12 month commitment for both you and your child. If you won't have time to work with your child to make the blocks, please don't sign them up. If you think your child will lose interest after a couple of months, especially if it isn't their turn yet to be the Bee Princess/Prince, don't sign them up. This isn't about you making the blocks for your child and fulfilling their commitment; it is about your child actually making them, sending them out and hopefully making some online quilting kid friends too. If in doubt, don't submit their name. If needed, talk to your child first. My other one big request is COMMUNICATE! Emergencies happen but not knowing just makes everyone else angry and I don't want any of that. I've seen way too many post on others' blogs about being months and months behind in Bee commitments and that should not be the norm here. If it is, you will be put on my list and possibly restricted from other events. I know this may sound a bit harsh but I've had some issues in the past with a select number of people and I want to prevent that again as much as possible. 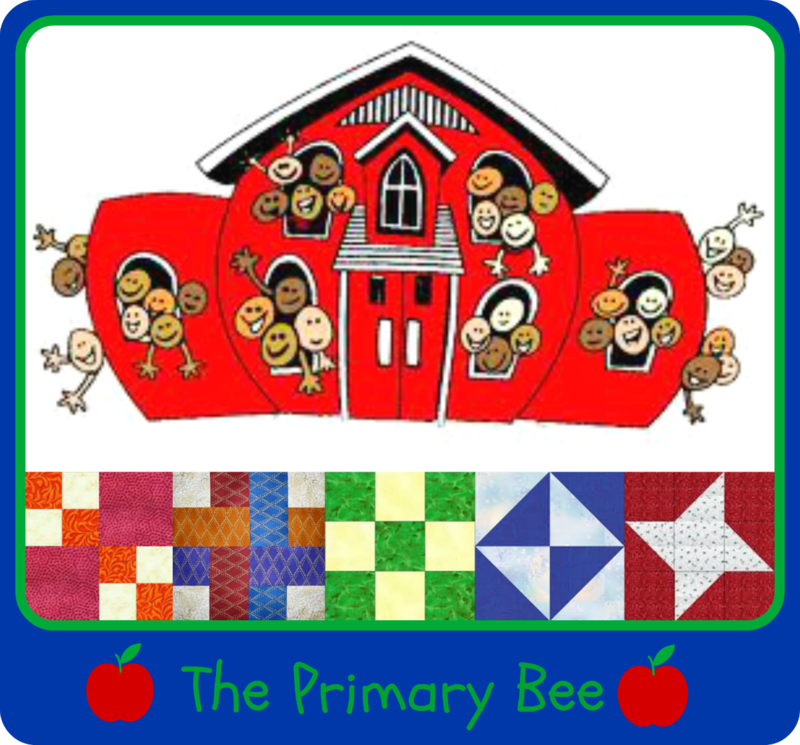 Once your child has been accepted into The Primary Bee, I will send you a confirmation email and you should add the Bee Button to your blog. I'm really excited about this event. My kids are even more excited. They keep asking me "When can we get started Mom?" I'm truly hoping that through this Primary Bee our kidlets can learn just how wonderful the online quilting community is. I don't have kids yet but this is a really cute idea! I hope you get lots of interest! This is a wonderful idea. I do not have children in that age group amd my grandbabies are not old enough yet. I cannot wait to see what the children come up with, fun! Ohhh sounds fab is it international? If not do u have time to sort European version or I can help you with one ?